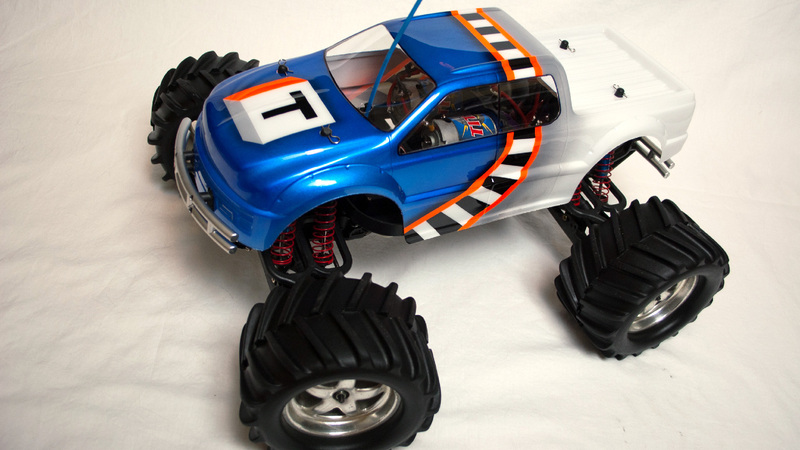 One of the best ways to personalize an RC kit is to give it a fresh coat of paint. This guide will focus on the basics of painting bodies for RC cars–a genuinely fun and rewarding art form. 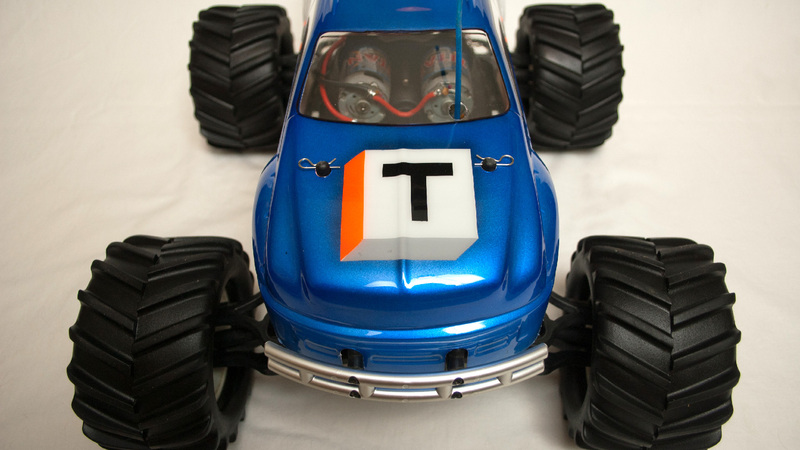 We’ve run through the basics of several types of remote controlled vehicles, from cars to boats to planes–and some tweaks to modify them. But one of the best ways to personalize an RC kit is to give it a fresh coat of paint. 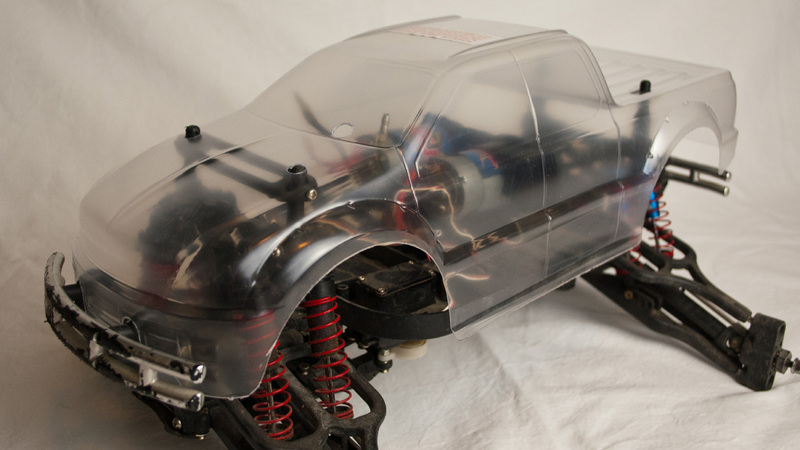 This guide will focus on the basics of painting bodies for RC cars–a genuinely fun and rewarding art form. 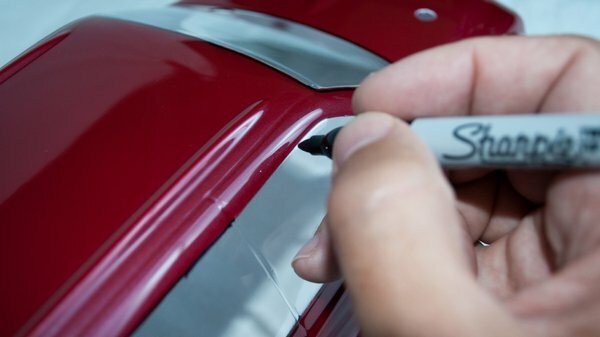 If you are an accomplished airbrush or spray paint graffiti artist, you already possess many of the skills necessary to paint a RC car body. There are, however, a few elements that are specific to painting car bodies that you must consider. The number one thing to know is that most paints will not stick to Lexan. 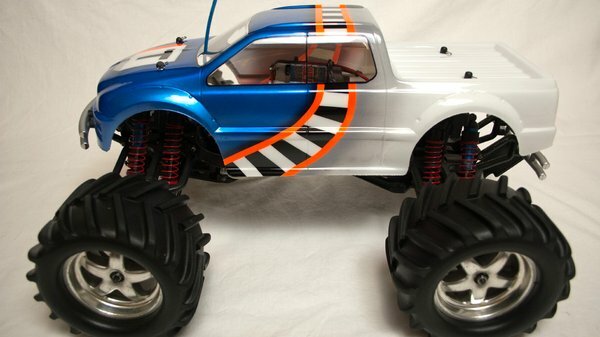 You must use specially formulated products that are typically sold in hobby shops as RC car body paint. This isn’t a marketing gimmick. These are truly the only paints I have seen that bond reliably to Lexan. If you use some random hardware store paint, it will only look good until that first crash. Then, the paint will begin to chip and flake off, randomly eroding your artistic efforts. Trust me; don’t get cheap with the paint. Buy the right stuff and have no regrets. Since we will be painting the inside of the body, some things may be reversed from painting tasks you are used to. Obviously, any masking must be done as a mirror image. Less obvious is the need to apply the darkest colors first. Since it is difficult to achieve a fully opaque finish, having a dark color behind a light color may affect the tint of the light color. Applying the dark color first negates this effect. Keep this in mind as you plan out your paint scheme and order of operations. 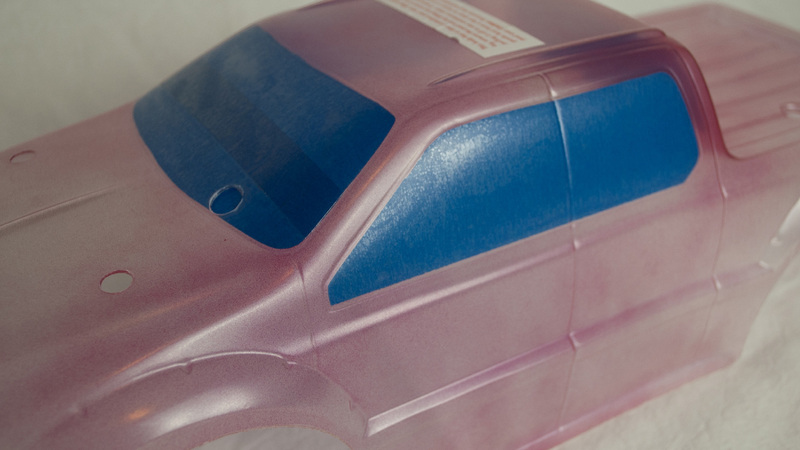 WORKING WITH LEXAN REQUIRES SPECIAL PAINT AS WELL AS SPECIFIC TOOLS TO ACHIEVE CLEAN, LONG-LASTING RESULTS. A VARIETY OF COMMON MASKING OPTIONS CAN BE USED. You may need to do trimming or drilling of the car body. I highly recommend using tools designed for the job. The curved blades on Lexan scissors make it easy to trim wheel wells and other rounded areas without creating jagged edges on the body. A tapered reamer is the only sensible way to drill holes in Lexan. Regular drill bits will grab and tear as they go through, often leaving a mess. . If you are using a body that will require cutting and drilling, it is usually better to do this before painting. It helps to have the body clear when you are trying to get everything aligned and fitted. There is a seemingly endless selection of Lexan bodies. Manufacturers will often offer replacement bodies for the vehicles in their lineup. Aftermarket companies also sell a range of bodies in many different styles. 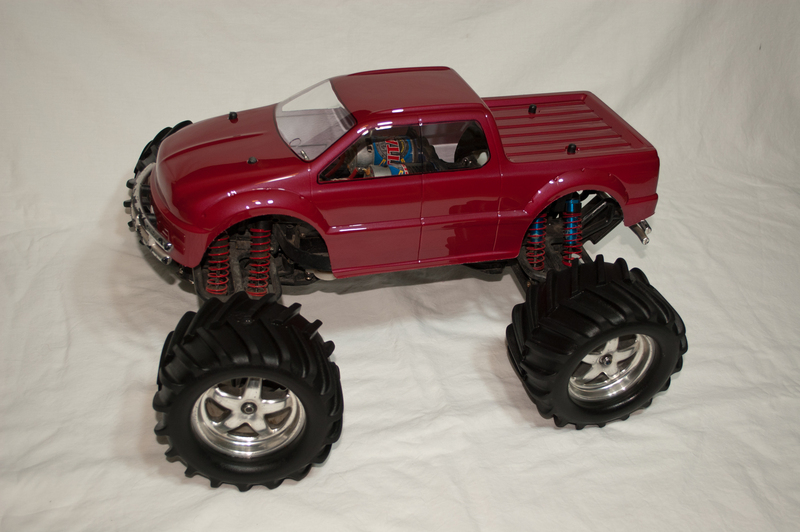 Some are designed for a specific vehicle, others are more generic and can be adapted to whatever RC car you please. LEXAN CAR BODIES ARE STOUT STUFF. THIS GARAGE-SALE TREASURE HAS SEEN MUCH ABUSE BUT ITS ONLY PROBLEMS ARE COSMETIC. I REPLACED THE BODY ANYWAY. 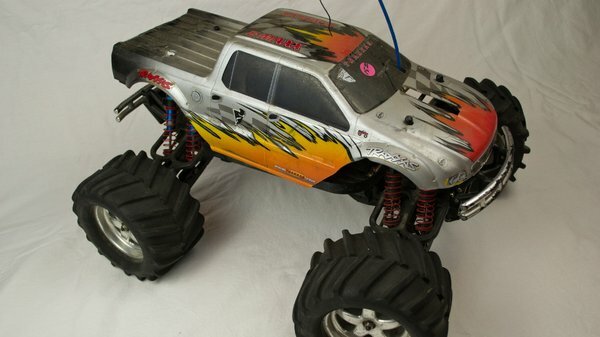 My brother-in-law recently gave me a Traxxas E-Maxx monster truck that he found at a garage sale for just $15. He’s always had a knack for finding super deals like that. Other than the missing transmitter, the E-Maxx appeared to be complete and in relatively good condition. Thanks Dan! Since I planned to replace the haggard shell on the E-Maxx anyway, I thought that it presented a good opportunity to illustrate the basic techniques of painting a Lexan body. I actually bought two bodies. 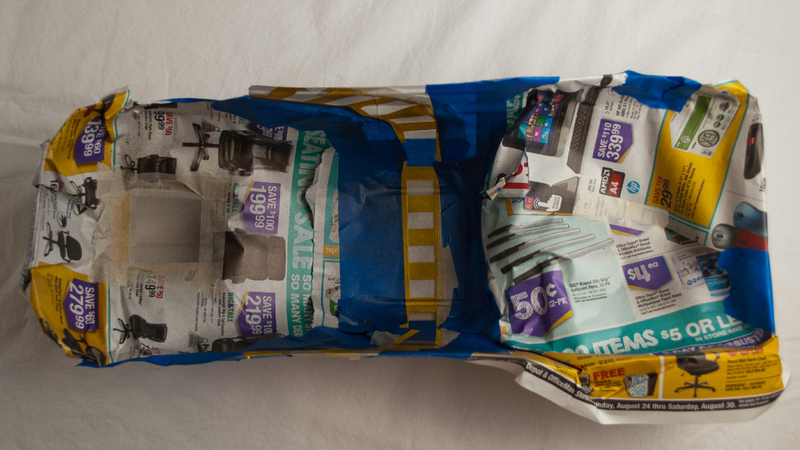 On one, I will show a very basic, single-color spray can paint job. With the other body, I will illustrate a more complex multi-color motif that necessitates an airbrush. THIS REPLACEMENT BODY FOR THE TRAXXAS E-MAXX COMES TRIMMED AND DRILLED TO FIT THE TRUCK. IT ALSO INCLUDES A TRANSPARENT OUTER MASK. ALL OF THESE FEATURES EXPEDITE THE PAINTING AND FITTING PROCESSES. The bodies that I purchased are Traxxas’ replacement units for the E-Maxx. They are trimmed and drilled for the truck, so that was a big time saver. What I like most about these bodies is that they have a transparent mask on the outside. This prevents paint overspray from getting on the outer part of the body. It is easy enough to mask the outside yourself, but having a transparent mask means you don’t have to remove it every time you want to see how the body looks from the outer surface. I did a quick fit check to make sure the body fit the truck as intended (it did) and then got down to business. As with any paint job, the key to a good finish is proper surface preparation. In this case, the body must be washed to remove any dirt, oil, fingerprints, etc. I use a tiny drop of dish soap and warm water to wash the inside surface by rubbing it with a clean wet cloth. After rinsing, I used lint-free paper towels to get everything completely dry. Next I masked the windows. There are many ways to mask an area for painting. I typically prefer to use regular low-tack masking tape whenever I can. The blue household stuff is good for masking large areas and that’s what I used for the windows. Liquid mask is good for compound curves and complex designs. For stripes or small areas, thin vinyl masking tape works very well. You can also use frisket film, which is a little like adhesive shelf paper. I used a variety of these masks on the airbrushed body, which I will explain later on. 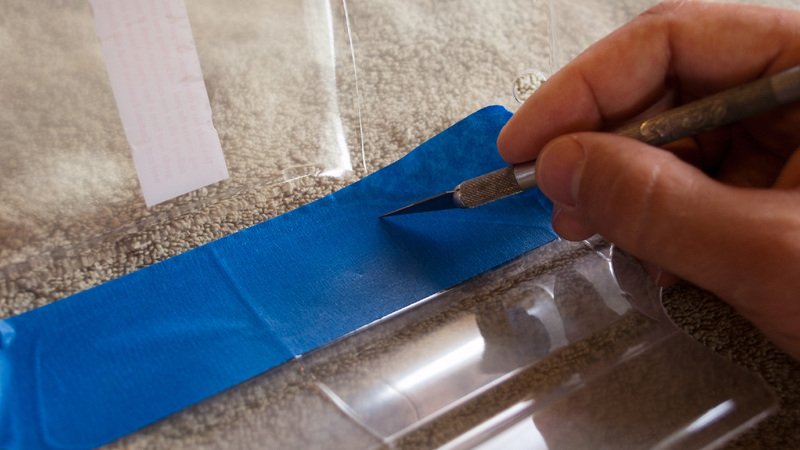 A SHARP KNIFE AND A LIGHT TOUCH ARE ALL YOU NEED TO TRIM MASKING TAPE. ALWAYS MAKE SURE THE FINISHED EDGES ARE FIRMLY ADHERED TO THE LEXAN. Allow me to digress a bit further on the tape topic. One of my biggest pet peeves is when people set tape rolls down on their side. When that occurs, whatever dirt, dust, hair or other schmutz happened to be on that surface is now stuck to the edge of the tape. When you apply the tape as a mask, the clingons come with it and compromise the edge seal. The result is often color bleeding on your painted edges. To mitigate this, I keep a few generic-use rolls of masking tape handy and visible to the rest of the household while keeping my private stash of clean tape squirreled away in a Ziploc bag. I had to use the community tape for the windows, but it worked out okay. The windows are marked with small ridges in the plastic. I applied adequate tape to completely cover the area and then trimmed away the excess. I used an X-Acto knife with a new #11 blade for trimming. It takes a very light touch to cut through the tape and not dig into the plastic. The window ridge creates a natural guide for cutting. Once the cut was complete, I carefully peeled away the excess tape. I then used a fingernail to reseal the entire perimeter of the mask. THE FIRST COAT OF ANY COLOR SHOULD BE A VERY LIGHT MIST TO HELP SEAL THE EDGES OF THE MASKING MATERIAL AND ENSURE A DRIP-FREE FINISH. 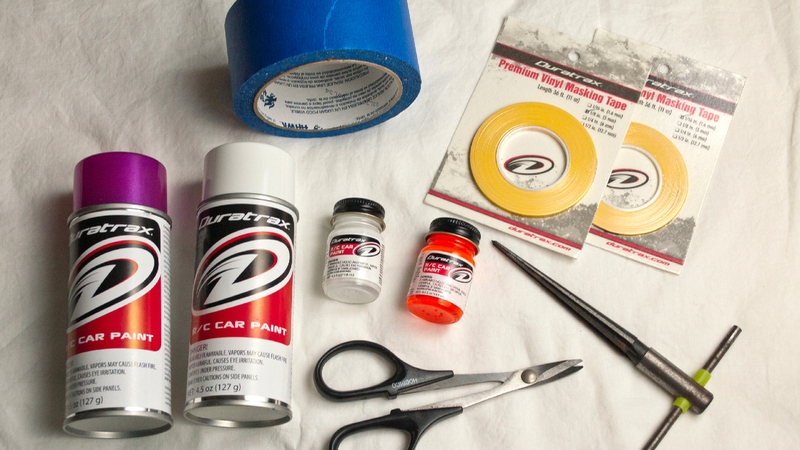 The paints I used are from the new Duratrax line of RC car paints. On this first body, I used the Metallic Red spray paint. I always start with a super-light mist coat of paint. This helps to seal the edges of the masks and prevent bleeding. Not all spray cans work the same. It helps to practice a little on a scrap piece of plastic or cardboard first, so you can get a feel for the spray characteristics of the nozzle. The mist coat dried within a few minutes, so I began applying subsequent coats, each only a little heavier than the mist coat. There’s no point in getting in a hurry and glopping on a heavy coat. It is likely to run and will take longer to dry. After about half an hour and four coats of paint, the body had a nice, even, red tint to it, so I moved on to the next step. Most metallic, pearl, and candy, and fluorescent colors are not intended to be used alone. They must be backed with a coat of silver or white to make them opaque. In this case, I applied two coats of white Base Cover Coat. This really made the color come alive. I then carefully peeled off the window and outer body masks. However I wasn’t quite done yet. I LIKE TO RUN A SHARPIE MARKER AROUND WINDOW BORDERS TO HELP HIDE ANY IRREGULARITIES IN THE MASKED EDGE. THE PAINTED BODY ONLY NEEDS HEADLIGHT DECALS TO BE COMPLETE. I EXPECT THIS PAINT JOB TO WITHSTAND A LOT OF ABUSE AND LOOK GOOD FOR A LONG TIME. After allowing the paint to dry overnight, I completed the final step of the paint job. I applied squares of masking tape on the underside of the body around the body post holes. This prevents the top of the body posts from scratching the paint each time you install the body. While it isn’t fancy, this red paint job is clean and should last for a long time. The advantage of using an airbrush is that it allows much more precise control than a spray can over the amount of paint that comes out and the size of the spray pattern. This precision opens up many possibilities for custom designs and effects. My meager airbrushing abilities only scratch the surface of what is possible. With the second E-Maxx body, I created a paint scheme that is simple by airbrush standards. Yet, it displays some of the subtleties that are possible. My goal here is not to teach you how to use an airbrush, but rather to help you to see why you should learn. WHEN USING AN AIRBRUSH TO PAINT SMALL AREAS, IT IS IMPORTANT TO MASK ANY PARTS THAT YOU DO NOT WANT PAINTED. I used frisket film to create the Tested “T” logo on the hood. I first cut out the entire logo design on my workbench (as a mirror image) and then applied the completed mask to the hood. To help me align the mask, I drew reference marks on the outside body mask with a Sharpie. Next I masked off the orange, black, and white stripes that dissect the body. These were created freehand using flexible masking tape, also from Duratrax. This stuff is really flexible (like electrical tape), but doesn’t leave adhesive residue. It takes a little practice, but you can get this tape to fit around compound curves and features in the body relatively easily. Once the features were masked, I used newspaper to mask most of the body. I left only the soon-to-be black stripes and “T” open. Remember: darkest colors first. I used spray paint for that quick job. Next came Candy Blue for the front of the truck. First, I custom mixed a darker shade of blue by mixing in a little black paint. I then added thinner to get the paint to the right consistency for airbrushing. I applied this darker color to create a fade where the blue meets the forward orange stripe. I also added light touches of this color around the window frames and the T logo to give each a little depth. I made a grey color by mixing white and black. This was applied behind the rear orange stripe. It transitions to a lighter grey, and then to white. Somewhere while doing this fade work, I added a shot of grey to the bottom panel of the T logo. The Fluorescent Orange was airbrushed next. It required a white undercoat. I was able to kill two birds with one stone by painting the white areas and undercoating the orange in one shot. Once the white dried, I traced the window outlines with a Sharpie and called it done. Again, it isn’t a very complex paint job, but it should give you an idea of the effects that are possible with the control afforded by an airbrush. THE COLOR FADES AND HIGHLIGHTS ON THIS BODY ILLUSTRATE SOME OF THE SIMPLE EFFECTS THAT ARE POSSIBLE WITH AN AIRBRUSH. MANY MORE EXOTIC POSSIBILITIES ABOUND. I hope these tips will encourage you to try painting your next RC car body. I think it is a lot of fun to do and the creative possibilities are endless. Life is too short for production line paint jobs!